PEARL HARBOR, Hawaii - The USS John C. Stennis Strike Group (JCSSG) arrived in Pearl Harbor, Hawaii June 28 and 29 to participate in the Rim of the Pacific (RIMPAC) exercise. JCSSG, also known as the Navy’s first Great Green Fleet (GGF) strike group, consists of USS John C. Stennis (CVN 74) with Carrier Air Wing (CVW) 9 and Destroyer Squadron (DESRON) 21 embarked, guided-missile destroyers USS Stockdale (DDG 106), USS ChungHoon (DDG 93), and USS William P. Lawrence (DDG 110), and guided-missile cruiser USS Mobile Bay (CG 53). The world's largest international maritime exercise, RIMPAC provides a unique training opportunity that helps participants foster and sustain the cooperative relationships that are critical to ensuring the safety of sea lanes and security on the world's oceans. 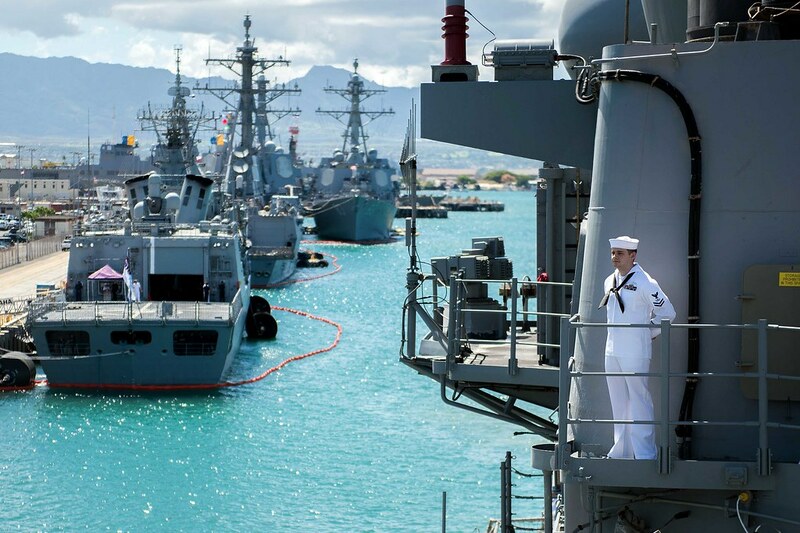 More than 40 ships and submarines, more than 200 aircraft and 25,000 personnel are participating in RIMPAC from June 30 to Aug. 4, in and around the Hawaiian Islands and Southern California. RIMPAC began in 1971 and is held every two years. In 2012, the exercise met one of Secretary of the Navy Ray Mabus’ five energy goals, to demonstrate a Green Strike Group operating on alternative fuel. U.S. Navy ships and aircraft used 900,000 gallons of a 50-50 blend of renewable diesel and traditional petroleum as a proof of concept. This year, RIMPAC participating countries will use 11.2 million gallons of a 10 percent alternative fuel blend during the exercise. This is the same fuel used earlier this year by JCSSG, during the first operational deployment of a GGF strike group. The principles behind the GGF initiative direct the use of energy efficiency measures, to include technologies and operational procedures, and alternative fuel in the course of normal operations. The alternative fuel that will be used during RIMPAC is derived from waste beef fat from the Midwest. Alternative fuels can be made from animal waste oil, algae, or non-food crops. The fuel must be “drop-in,” requiring no modifications to engines or procedures. Having alternative fuel in the supply chain increases operational flexibility by allowing forces to obtain fuel from more sources worldwide. Providing a combat-ready force to protect collective maritime interests, JCSSG is on a regularly scheduled Western Pacific Deployment.